Caracara Pass. One of seven passes on the Cordillera Blanca trek. I'll be honest. I really had no expectations for this trek. Having done the Teton Crest Trail, Everest Base Camp, the W Trek in Chile and the Tour du Mont Blanc in Europe, I was looking for something in the high Andes. I had heard people speak about the Blanca for years, but it is only known to serious trekkers. And yes, while I had seen photos, I really had no idea what to expect. Suffice it to say, I was awe-struck. Continually on this trek. What is wonderful about it? For starters you climb seven passes (ranging from 14,000 feet to almost 16,000 feet) in nine days. All of these passes are wonderfully different as are the surrounding peaks. You are looking up at a multitude of peaks in the 19,000 feet to a few in the 20,000 feet range. The Andean peaks are dramatic, hugely so. Largely, because they are a fairly "new" mountain range. They haven't been as eroded as the passes and peaks in Europe. They are ragged, rough and defiant. But what is wonderful about this trek is the combination of these peaks with magnificent valleys (where you usually camp at night). I am talking about hugely remote valleys: imagine valleys one mile across and five miles long. Usually these valleys have but one or two families occupying them. At most, a valley might have 10 families. The fauna and flora are stunning. Wildflowers abound everywhere. We saw 7 condors during our trek. I could watch condors glide all day. Finally, though, I would say it is the remoteness of this trek that I loved. Part of wilderness to me is not just nature's majestic, fierce beauty, but the remoteness of it. Unlike the Tour du Mont Blanc or the W Trek or certainly Everest Base Camp, this trek was incredibly unpopulated. We saw only one other trekking group during our trek. That is kind of stunning. While the Santa Cruz trek, nearby, is very popular because it is shorter, the Cordillera Blanca is more remote and empty. It was just wonderful. Because of the remoteness, you felt closer to nature. In college, I spent two summers working in Yellowstone. And while Yellowstone and Grand Teton have special places in my heart. I believe Glacier National Park in Montana is my favorite. Largely because it has the most dramatic backcountry of any park. Where else can you hike and visit our last remaining glaciers and wonder at the magnificence of glacial u-shaped valleys. If you haven't been you need to go...now before the glaciers are gone. The park has several historic lodges and wonderful lakes. My favorite is Many Glacier Lodge on Swiftcurrent Lake. The lodge is quaint and full of history with magnificent views of Swiftcurrent and the mountains beyond. Many Glacier Lodge is where I would go to hole up and write the great American novel. Or in my case, a comic book. But the views are amazing and the rooms rustic and charming. From here you have so many choices. You can hike to Iceberg Lake. Just a stunning location. And it's name fits it. When I jumped in on an August afternoon, our guide's thermometer read 39 degrees F.
Iceberg Lake lives up to its name. It was 39 degrees F when I jumped in. One of my favorite hikes is to Grinnell Glacier. Here is a short video of the trek there. Which begins with two shuttle boat rides from Many Glacier Lodge dock across Swiftcurrent Lake and Lake Josephine. The other wonderful thing about Glacier is how the Going to the Sun Road, takes you up to the continental divide. From there you can hike high above the glacial valleys on the Highline Trail. Your car or transportation did the hard work and now you get to enjoy the fruits of your elevation gain. From the Highline Trail, you can access Granite Park Lodge and the Garden Wall Trail where you are rewarded with magnificent views including Grinnell Glacier (be forewarned, while the Highline Trail is relatively flat, the climb up the Garden Wall Trail and Glacier Overlook is 1,000 feet of elevation gain in one mile). The other thing you should know is that the Highline Trail can at times be narrow, with drop offs, there are cables to hold onto and for the most part the trail is comfortably wide. Again, this trail is largely flat until you get to the trail for the Garden Wall. I have hiked miles of the undulating Highline Trail with people in their 60s and 70s. Here is a short, one minute video of the Highline Trail. Finally, another favorite of mine is Lake McDonald Lodge. Again this is another historic lodge with wonderful veranda views of Lake McDonald. There is a dock with watercraft and a scenic boat tour. This lodge and the Many Glacier Hotel are both historic and great places to clean up and enjoy a nice bed and meal after a through hike or backpack trip. Hiking back to Chamonix on the last day of the Tour du Mont Blanc. To the left are the Needles, and dead ahead is Mont Blanc. The Tour du Mont Blanc has been often touted as a top ten-trek trip: a true bucket list trip for those who love to trek. In speaking to Tara at Mountain Travel Sobek, the adventure company I had chosen, she had compared the Tour du Mont Blanc with the Everest Base Camp Trek (a trek we had both done). The Tour du Mont Blanc offers you the opportunity to trek around Europe’s tallest mountain, and in doing so, trek through three different countries, and not insignificantly, the opportunity to sample their respective cuisines and cultures. There is no shortage of incredible cheeses, barista beverages, pastas and wines to sample. I think this is what Tara was referring to. While challenging, this trek’s food, drink and cultural offerings make it fairly civilized. There are also different ways to do this trip. The typical tour takes 10 to 11 days, but there are also express tours that take only six days with a few short van shuttles to trailheads and hotels. Obviously the full tour is ideal but for those with tight schedules the express hits the major highlights. You won’t miss any of the important passes on the express. Our guide, Flo, leads us up and out of the Chamonix Valley from our start in Les Houches. The Tour typically departs near Chamonix in Les Houches in France. From there you hike up and over towards the Mount Blanc train station and then down to Les Contamines. This day typically is around a 2500 foot ascent and a 2800 foot descent. Which seems close to the average for the trip. Although typically the ascents are closer to 2800 feet to 3000 feet. First day, hiking under the Mont Blanc massif. The next day or so finds you climbing an old Roman road to the spectacularly scenic Col du Bonhomme 7,641 feet, the first of your passes on this trip. The hike up the Col du Bonhomme takes you along an old Roman road. This hike must have been fun in Roman sandals. On our trip, we found ourselves high above the mist and clouds as we approached and climbed this pass. Our guide, Flo, hiking with an umbrella in the rain. I had never seen a guide hike with an umbrella before. But the French have a certain savoir faire, non? As we hiked this morning our guide, Flo, opened an umbrella. I had never seen a guide hike with an umbrella before. But Flo is the fifth generation of a family of French guides and mountaineers. She is a member of the distinguished Compagnie des Guides de Chamonix and has guided for over 20 years. So who am I to argue? Besides the French have a certain savoir-faire, non? Actually, Mountain Travel Sobek’s use of guides from the Compagnie des Guides is one of the reasons why I went with Mt. Sobek. Flo knew everything there was to know about the French Alps, often took us off the main trail to bushwhack across terrain and told me about two other treks that are on my bucket list. Hiking past Col du Bonhomme we find ourselves in and above the clouds. Anyhow when we climbed to Col Croix du Bonhomme 8,100 for lunch we passed a herd of ibex, untold marmots and fields of wildflowers. This day is called the toughest day of the tour with its 4200 foot ascent and 3000 foot descent. A word about difficulty: the Tour is strenuous. It’s hard to compare it to Everest Base Camp, the trips are hard for different reasons, and the Tour du Mont Blanc has virtually none of the altitude issues that the EBC trek has. But you will need to be in shape. I am in my fifties, and in pretty good shape. But in the spirit of true confession, I had surgery three months before this trip. I climbed out of bed 11 weeks prior to the trip and headed to the gym where I worked out six days a week, including running a few competitive races, and I did okay. Just make sure you are hiking, doing some boot camp classes, and stair master sessions of course. Everybody’s training method is different. But suffice it to say if you work out an hour a day, hard, for three months prior, I think you will be okay. Hiking down from Croix du Bonhomme to the little town of Chapieux. How small? 12 people. In the winter they must evacuate their village because of avalanche danger. Anyhow back to the tour. The day you climb down from Croix du Bonhomme has you land in Les Chapieux. A town of three hotels and a dairy but only twelve residents. In the winter, all of the residents must leave because the avalanche danger on road to the town is so high. In effect, the residents have a summer house and winter house. But our inn and prepared dinner were both superb. Unlike a trip like Everest Base Camp, here you are enjoying the different country’s cuisines. And well actually enjoying cuisine. The town of Chapieux has stayed with me. While it takes about five minutes to walk it, its history (it’s close to the Italian border and was attacked during WWII) and its charm has lingered with me. On the outskirts of this town is a well-regarded dairy (they largely make Beaufort cheese) and yes they and their cows must evacuate the town in the fall before the snows begin. In fact the town has a procession with each cow wearing a flower crown. My friend Andrew climbs out of Champieux and the Vallee des Glaciers towards Col de la Seigne where we will cross into Italy. The next day you will leave the Vallee des Glaciers and hike up an over Col de la Seigne (8,245 feet). Here you cross into Italy and have a spectacular view of Mont Blanc, which rises heroically 10,000 feet above. That afternoon there is a hut next to two glaciers that serves eagerly awaited cappuccino and polenta. Molto bene as they say. Having just crossed over Col de la Seigne, we hike down into Italy and a nice pasta dinner. The next day or so will see you leave Courmayeur in Italy and begin the spectacular hike up past the Glacier de Pre de Bar and past Mont Dolent on your way to Grand Col Ferret (8300 feet). Hiking out of Courmayeur and up towards Grand Col Ferret where we will leave Italy and enter Switzerland. This day is for many, along with the last day of the tour as you hike back into Chamonix Valley, the most scenic day of the tour. The view on the hike up is as I said, simply spectacular. Half an hour more to the top of Grand Col Ferret. Even though it was early August it was snowing lightly near the summit when we crossed Grand Col Ferret into Switzerland. Hiking down into Switzerland, one of three countries you'll trek through on the Tour du Mont Blanc. And our guide, Flo, had fun taking us across one of the six or so snowfields we would encounter on the tour. Even in August you encounter a few snowfields near the passes. This is just past Grand Col Ferret. All of the tour is amazing but the French and Italian sections particularly so. The last day on the tour, we hike back into the Chamonix Valley, you can see the Needles ahead and Mont Blanc peeking on the right. In particular, after you cross back into France, the last section and day of the tour is simply stunning. Here you hike high above the Chamonix Valley. Chamonix Valley in all of its glory. The last day is spent enjoying views of the Le Tour and Argentiere glaciers, the Needles (including the Green Needle, and the entire Mont Blanc range including Mont Blanc itself. One of the Chesery Lacs. There are five total. All swimmable. If you like screaming as you swim. You will also pass the Chesery Lacs and if you are brave enough, as a few of us were, you could slip into one of them for a quick swim. I emphasize the word “quick” as the temperature will provide you some encouragement to head back to shore. The tour then heads back down into Chamonix where a nice French dinner awaits. I had never experienced a trek like this: one made up of absolutely spectacular views, strenuous climbs, and rewarding, wonderful dinners at night. Mont Blanc on the right. Chamonix sits in the valley below. The Tour du Mont Blanc will leave you feeling physically spent, exhilarated by the views and feeling somewhat guilty about the meals you enjoy at night. But what’s life without a little joie de vivre, non? Take Jimmy Chin's Advice and hike the Teton Crest Trail. In an article in Men's Journal last year, famed National Geographic photographer and adventurer Jimmy Chin called the Teton Crest Trail "a bucket list item" and declared, "If you do one high alpine hike in the U.S., this should be it." 40 miles, four days and several passes later, I could not believe the beauty and wonderful campsites I encountered in Grand Teton National Park. The trail rarely dips below 8,000 feet, and while there are some arduous passes (climbing the Continental Divide at Paintbrush Divide is no picnic), it is as Jimmy says a glorious high alpine trek. Thank you Jimmy. Since this is a high altitude hike, this trip is best done from mid-July to mid-September to avoid too many snow fields. You will need to allow time to get a wilderness camp site permit from one of the Grand Teton ranger stations. You can do this 24 hours before your hike or you can go on line from Jan. 1st through May 15th and reserve in advance . Since time was of the essence, and the trip was already four days, I started this trek by taking the tram from Teton Village to the top (which saves you a steep climb). I spent the night before at Aplenhof Lodge which is next to the tram and serves a huge breakfast. The folks there were great and kind enough to transport some gear to my final stay in Jackson. I took the tram that morning to the top, and there I started on the Granite Canyon Trail and headed off to Marion Lake. Marion Lake, by the way, is not a bad place to camp the first night. Unfortunately, campsite reservations were slim when I checked into the ranger station the day before. In fact there were none. So my first day, I had to go 16 miles to get outside the park to Alaska Basin (part of the Teton Crest Trail leaves the park at Alaska Basin) where permits are not required. It was a challenging day but it was also beautiful day passing field after field of wildflowers. Carpets of lupine and other wildflowers exploded across the horizon. I had never seen anything like it. Particularly past Marion Lake. After Marion Lake I headed to Fox Creek Pass 9,650 feet and onwards onto the scenic Death Canyon Shelf where I encountered a dramatic thunder storm. At this elevation you are extremely close to the thunder and yes, lightning. I hunkered down in a stand of pines and weathered rain, yes and bit of hail. Storm approaches and I head for that stand of pines to the right. Camping at Marion Lake makes for a short first day. Death Canyon Shelf, however, is a stunning place to camp with campsites looking down into the canyon below. Some people choose Death Canyon Shelf as their first night's campsite, but if you have six days, you could camp the first night at Marion Lake and spend the second night on the Shelf. After the storm passed, I then hiked down to Alaska Basin where I was greeted by two moose and a wonderful 360 view of mountains. This is also a popular camping spot, but there is plenty of room to spread out. Since it is outside the park and there are no designated campsites you can pitch your tent wherever you choose to. There are plenty of neighbors if you want company and if you don't, there are plenty of spots to move to. After hiking 16 miles, I got my tent set up, crawled into my sleeping bag and moaned for about half an hour. I should add that I am 59 years old. So hiking 16 miles the first day solo, and carrying a 40 lbs pack, was a bit challenging. Nevertheless I made dinner and turned in for an early night. When I woke up, I truly appreciated the 360 view of Alaska Basin. You are in bowl with plenty of ponds, surrounded by mountains. It is simply stunning. Day two meant, climbing out of Alaska Basin towards scenic Sunset Lake which is just gorgeous and a great place to take a break. I then headed up and over the 10,372 foot Hurricane Pass, the first truly challenging pass (it's a 800 foot elevation gain from Sunset Lake). When you reach the top of Hurricane Pass you are greeted by a simply spectacular view of the Grand, Middle and South Tetons. This must be one of the most spectacular views in all of the United States and it is a photographer's dream. The view from the top of Hurricane Pass. After taking quite a few shots I and then headed down through South Fork Cascade to North Fork Cascade where my campsite was. Both South Fork Cascade and North Fork have wonderful campsites with great views. South Fork has a wonderful view looking up towards the pass and the Tetons with a roaring river. I thought I would regret not camping here, but the view from my campsite in North Fork Cascade was simply amazing. From my tent I stared until nightfall at the Grand Teton. You'll see a photo taken from my tent of Grand Teton above. I had never had a campsite with such a glorious view. Hiking Hurricane Pass and raindrops pelting my tent all night meant I had a great sleep. The view from my campsite in North Fork looking at Grand Teton. Day three I climbed up the North Fork past stunning Lake Solitude (9035 feet), another photographer's dream, and on towards the 10,720 foot Paintbrush Divide which is truly rigorous. I was traveling solo, so my pack was fairly heavy (the park provides bear cannisters but they are heavy) and the switchbacks are never ending. You need to be in good shape for this day (a 1500 foot elevation gain). Again I am 59 and it took me four hours to climb it. Getting closer to the divide, you have great views of the Tetons. It is just a stunning stretch of trail though with wonderful views, particularly of the Grand Teton. The view that greets you at the top is magnificent. A great place to take a panoramic and video. Paintbrush Divide. Toughest day of the hike. I then hiked down Paintbrush Canyon. Be warned that the trail down from the pass is extremely steep in parts and even in early August there was a 75 yard snow field at one point. During this hike down I ran into a hiker carrying a 9 mm pistol who said she had seen a grizzly down the trail. As she said this, I detected a slight mocking smile at my anti-bear spray. This was a bit of a reminder that yes, we were in bear country. The view from my campsite in lower Paintbrush Canyon. The views from every campsite were spectacular. For my last night, I camped in Lower Paintbrush Canyon which again offered an amazing view of Teton National Park and several lakes. Once again, rain led to a pleasant snooze. Be prepared, I encountered rain every day on the trail (fortunately usually at night). Day four I got up and had a short hike out down the canyon and out along wonderful Jenny Lake and then took the park ferry across Jenny Lake back to Jenny Lake Ranger Station. Crossing Jenny Lake. I can almost taste that night's burger and fries. This was the most beautiful backpack I have ever done in the United States. It is more challenging, at least for me, than Jimmy lets onto. While as he says the trip is at elevation, there are I believe four mountain passes to cross, meaning there is some climbing up and down to say the least. But the trail rarely goes below 8000 feet. As a result the views and campsites are spectacular. Thanks Mr. Chin for the recommendation. It is 4 a.m. I am suddenly awake in my tent. Not because it is 22 degrees outside. But because I hear a sound I don't recognize. Then it dawns on me. It is my tent mate. He is peeing into a water bottle. This sound would wake me up two more times that evening. He and others had bought water bottles earlier in the day for the express purpose of avoiding having to get up and unzip the tent and trudge outside at 4 am. Now I tell you this, not to gross you out. But because these are the kinds of things that make trekking to Everest Base Camp hard. It's the difficulty of hiking and camping at altitude for a long stretch and everything that goes with it. Don't get me wrong, the physical challenges of the trek are hard. There's no denying it. Especially if you choose to climb Kala Pathar after you climb to Everest Base Camp. One really does need to prepare. For months before my trek, I worked out six days a week. I primarily did boot camp classes with a lot of squats in them (your glutes are your friends when you climb 8 hours a day). I also did stair master sessions. Sometimes I would finish my bootcamp class by doing an hour of stair master. I did a lot of spinning (you need your quad muscles too). Finally, I ran. I participated in a series of races and I did two half marathons in the month before I left for Nepal. Others in my group who lived out west hiked every weekend. A good friend simply stair mastered and did spinning. Whatever physical regimen you choose just make it rigorous, say an hour a day, six days a week for three months prior to your EBC trek. So while days like climbing to Namiche Bazaar were a bit hard, the hardest challenges of going to Everest Base Camp for me, was the other stuff: the challenges of trekking at altitude and trekking in Nepal. What do I mean by that? For one, I didn't shower for 14 days. There are a lot of opportunities to get sick on Everest (virtually everybody had something, and I had a sinus infection) but the last thing our guides wanted was for us to swallow water in the shower and pick up a parasite. So you're a bit gross. But then so is everybody. Two, because my group was in tents, not every night but a lot of nights (versus other adventure companies who spend every night in tea houses), and I was exhausted and it gets tiring changing your clothes in tents, I simply didn't bother changing my clothes the last three days before the final push to EBC. As for tents or teahouses. I wanted to camp in tents but honestly it did make the trek slightly more difficult and frankly they are usually pitched just outside the teahouses. So if you want a bit more comfort go for the teahouses. They are still rudimentary with virtually no heat (except in the common rooms). So you are still roughing it if you will. Then there's the altitude and everything that comes with it. The altitude just tires you. And frankly you worry about it. The last thing you want is to fly halfway around the world, and not be able to make it to base camp because of altitude sickness. To cope with that many of us took diamox. This was debated a lot. Once we landed in Lukla, I took anywhere from 250 mg to 500mg a day. Diamox helps you get rid of the carbon dioxide that builds up within you at altitude and hopefully prevents altitude sickness. Some felt it was cheating. Personally I think if you have trained and can cover the physical challenges (which I did), I didn't want be prevented from going to EBC because my body wasn't capable of getting rid of the excess carbon dioxide. Almost everyone on our group eventually took it. And it's important to note that everyone in our group made it to Everest Base Camp. To fight altitude sickness it is important to drink just a ton of water. Over a gallon a day. I think it's particularly important to drink early. By the time a headache hits you, it's almost too late for fluids to take effect. So I would drink two liters by mid-day each day and another two liters in the afternoon. We also had two doctors on our trip and they gave us a great recommendation. When climbing, focus on your breathing, particularly on exhaling. You want to rid your body of the carbon dioxide. So as you climb breathe out hard through your mouth. And while everyone knows the adage "one foot in front of the other", this breathing technique (inhale with strong exhale) will put you in a rhythmic mood and take your mind off those endless switchbacks above you. You're sleeping in tents, it's cold (when we started out for EBC it was 10 degrees at 6 a.m.), your tent mate is waking you up every few hours peeing, you are worried about getting altitude sickness, you probably have a cold, you might have digestive issues (welcome to Nepal), you haven't showered in 14 days...I think that just about covers it. Except, if I can say it, things like yak dung. There is no fuel above tree line to burn, so they burn yak dung. It's everywhere, on the trails, drying in the sun etc. Everest Base Camp trail is the yak dung capital of the world. Now,It didn't bother me at all, but others didn't love getting cosy by the pot belly stove after a woman dumps a carton of yak dung in the top of it. So those are the challenges that make Everest hard. It isn't necessarily the physical toll (my two marathons were more challenging as was hiking Paintbrush Divide with a 40 lb. pack) it's the "everything else" I mentioned. The one day, though, I truly was tested was Kala Pathar. Ironically the final trek to Everest Base Camp is a low elevation gain, maybe 750 feet if I recall. It's a long and tough day because of the altitude. But Kala Pathar, if you choose to do it the next day (about four to five in our group chose not to after getting to Everest Base Camp), is steep. After the first 50 yards, I had to pull over, breathing hard. It's almost two hours straight up with never ending switchbacks. It is the tallest climb of the trip at 18.700 feet and steep. That's us at the summit below. All in all, Everest Base Camp is an amazing adventure. Just wonderful. Almost a week doesn't go by that I don't think about it. The scenery is absolutely stunning. Almost every day, after you are dropped off in Lukla, offers amazing views which only get better the higher you climb. You will be posting to your Instagram accounts long after you have returned. Nothing can prepare you for how beautiful the Himalayas are. You will probably make life long friends with members of your group. Many came solo because it's hard to find a friend who is either physically fit enough or has the time to spend 19 days doing a trip. So people are welcoming and wanting to share in the experience. The people of Nepal are amazing. Personally, this was as impact as the scenery. This is a country still dealing with the aftershocks of a devastating earthquake. Nevertheless virtually every person and child we saw shouted, "Namaste" at us as we passed. They are just incredibly nice and friendly. It is estimated that in 2016, post earthquake, trekking was down 60 percent. No country could use your tired muscles and tourism dollars more than the Nepalese. So start working out and book a trip. Everest changes you in ways that are hard to summarize. Think of it as a trip that comes with eye opening scenery, a chance to make life long friends, a great sense of personal accomplishment and the opportunity to witness a people who are as resilient as they come. I will leave you with one last image. One morning in Pheriche, a village you stay in one the way down from EBC, I was getting geared up to continue the trek down. Suddenly, a small little girl (three and a half or four, you can see her in the photo below) came up to me and offered me her only piece of chocolate. I declined of course but I was so taken by such a sweet, giving gesture. As I walked away, she quietly said, "Namaste." That's the one last thing you need to prepare for: a wonderfully resilient and giving people. The nice thing about rafting is anyone can do it regardless of physical shape. But it can be at times a little bit scary and requires a wee bit of courage. I had suggested to my wife that we raft the Middle Fork of the Salmon River for honestly about 15 years. She will back me up on this. Because as she says, she wished I had shut up about it. But for my 50th birthday my wife, being the person she is, put aside her fears and said to me let's do this thing. I was overjoyed and I was thinking about this on our first day as we stood on the banks of Boundary Creek (the put in for the Middle Fork) and received our safety lecture. I was trying to avoid my wife's glare, as the guides went into the dangers that could lurk. This was an intense lecture and a good one but I was hoping they would tone it down for my wife's sake. I could hear her heart beat from twenty feet away. Spoiler alert? We had an absolutely amazing trip and my wife, who has had a few anxiety ridden moments in her life would tell you it was a piece of cake and she would do it again, in a second. Okay, so what's so special about the Middle Fork. After the Grand Canyon, I think most would agree it is the premier raft trip in America. The Middle Fork of the Salmon runs through the River of No Return Wilderness (did they have to call it that I thought when I handed the brochure to my wife) in Idaho. 100 rapids over 100 miles. 60 of which are class three or fours. Keep in mind rafting ratings go to 6. But since 6 means it's not runnable there are no class 6s on trips. So a lot of fun. But best of all, unlike some raft trips where you find your river traveling next to a road or even a highway, this trip is almost virtually in wilderness. You do pass the occasional ranch (they have to have their own airstrips for getting in and out) but for the most part it's you, the guides, clients and the river and surrounding wilderness. By the way, count on virtually no cell phone coverage for most of the trip. Which was just fine by me. Why Mt. Travel Sobek? They are one of the premier adventure companies in the world. And they practically invented the rafting adventure trip. They do all kinds of trips around the world but they gained worldwide acclaim back in 1973 when they pioneered the first commercial rafting trip on Ethiopa's Omo River. Since then they have led first descents down rivers such as the Chile's Bio-Bio River, the Magoky in Madagascar, Namibia's Kuene River, Ethiopia's Blue Nile and China's Upper Mekong. The Middle Fork of the Salmon is a specialty of theirs and frankly, I was excited to talk to the guides at night and pick their brains about other trips. And they didn't disappoint. So anyway, back to my wife giving me an eyeful. The safety talk was over and we were told to go to our raft. We headed out and within our first 15 minutes, a submerged rock took one of our guide's oars right out of the boat. It was amazing to see her regain control of the boat and get another oar. After that, we both knew we were in good hands. Over the next few days, we had a choice of which rafts to be in. There are larger size oar boats (the equivalent of a Cadillac) that offer a smoother easier ride even in class fours. Here the guide does all of the paddling and you sit and simply gaze at the amazing scenery drift by. The second option is a smaller paddle boat that fits six clients. Here you and the others do the paddling with the guide of course. I liken this to the equivalent of a sports car, you feel the river and rapids more. And finally there are the "ducky" style kayaks which are a lot of fun and an exhilarating way to experience the river. So what can you expect over the course of five days on the river. For one thing the river and landscape are anything but constant. You quite literally drop in elevation over the course of those five days, descending from alpine forest down through seven ecological zones to an arid climate at put out. Most days after a great breakfast, you will spend about 20 miles on the river going through some of the country's legendary rapids: Velvet Falls, Sulphur Slide, Tappan Falls, Pistol Creek and Powerhouse. You will pull in to shore for lunch and maybe a trip to look at Native American pictographs and a side trip to a natural springs. Late in the afternoon, you'll pull in to your campsite which are magnificent. Most are sandy beaches along the river. There your tent is already set up and as the guides starting cooking dinner all you have to do is unroll your sleeping bag. After you unroll your sleeping bag in your tent, people meet for cocktails and appetizers and discuss the day's sights and rapids. Dinners are simple but wonderful. And after dinner was one of my favorite times. People would get together and talk with the guides and hear some of their experiences and trips they've led. But there were also hilarious charade games and mystery clue games with teams pitted against one another. In terms of comfort, you're in the sun all day getting splashed by some of the country's cleanest, freshest water. Not bad. But for those who want to shower at some point, there are sun showers set up like the one below. All in all, the Middle Fork of the Salmon River is a wonderful way to encounter wilderness with little effort on your part. It's one of the reasons why I believe anyone can enjoy adventure travel. You just need to have a tiny bit of adventure in you. It is 4 am. I am standing in a blizzard, 60 mile per hour winds driving snowflakes up my nostrils, shivering. I am dressed merely in a t-shirt, pants and hiking boots and I can’t find my tent. It was our first night in Patagonia and being 59 I had to get up to pee. Unfortunately I had not paid attention to what color our tent was. And there were only a mere 60 tents to choose from in our campground. Can you get hypothermia going to the bathroom in the middle of the night I wonder? I was in the Pehoe Campground, for many the first campground on the glorious W Trek in Patagonia’s Torres del Paine National Park, Chile. Two things had already struck me that first day. Just how absolutely stunning the landscape is. And two, just how fierce the infamous Patagonia weather can be. Hiking up to Grey’s Glacier we had experienced 90 mile gusts that knocked you down if you didn’t lean into them. Patagonia has mountains and fjords as far as the eye can see. The rawness of this country is can be attributed to several things. The inaccessibility of the land, the landscape, lack of people, lack of development and yes the weather. To get there from where I lived in Connecticut, I had to fly overnight from New York to Santiago, then take a four hour flight to Punta Arenas and then take a three hour bus ride (where all you see are sheep ranches, pampas and mountains peeking in the distance) to Puerto Natales. 15 hours of travel time alone. 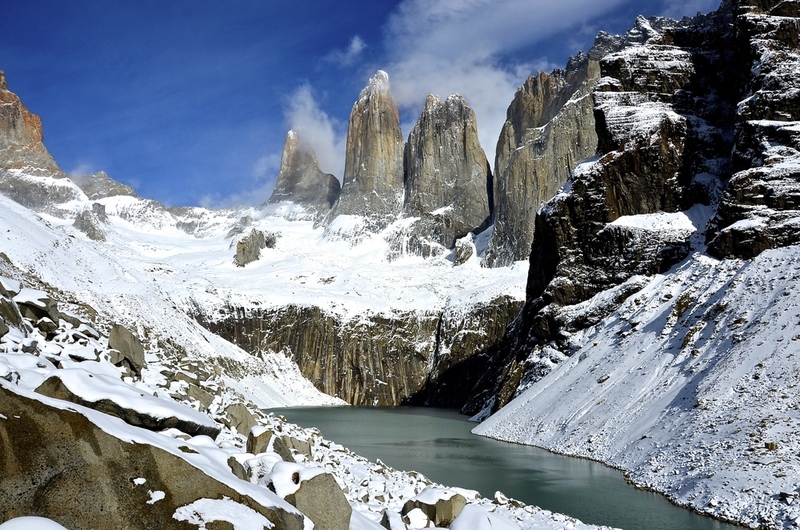 And even then you still aren’t in Torres del Paine Park. I think this is why the region thankfully isn’t developed yet. The day after our bus arrived at the bus terminal in Puerto Natales opposite the town’s jail (I would suggest the mayor move one of the two to enhance tourism), we took a scenic boat ride, past penguins, waterfalls and glaciers towards the park. And got our first glimpse of the famous towers looming in the distance. It’s important to note here: that the W trek typically takes four days. Our trek with Southern Explorations was designed so we saw the famous towers last. We looking back on it, I definitely preferred. Otherwise instead of taking a boat up the fjord towards the park one would drive and begin at the other end near Paine Campground and do the towers first. By saving the hike to the towers for the last day, we were in effect saving the best for last. After getting off the boat in Bernardo O’Higgins Park, we hiked up to see magnificent Serrano Glacier. If you’ve ever doubted climate change, this will certainly change your mind as you hike past marker after marker designating where the terminus of the glacier used to be. We then suited up in weather gear for a thrilling zodiac boat ride up the Serrano River to enter Torres del Paine National Park. After a night camped by the Serrano River, we took a boat the next morning across Lake Pehoe in high winds. We were supposed to take a boat to Grey Glacier but it was cancelled due to high waves from the fierce winds that blew across the lake... a hint of the weather to come. This was to be our first leg of the W Trek, we hiked up to Grey Glacier. At Grey Glacier overlook, we experienced 90 mile an hour winds. Which literally knocked you down if you didn’t lean into the wind. We then hiked back down and camped in Pehoe Campground. This campground is the big jumping off point for the W Trek and other treks so it is the most crowded. And this was where I got lost at 4 in the morning. Peeking out of our tent, we awoke to see the sunrise exploding over Lake Pehoe. It is one of the most stunning sunrises I have ever witnessed. There was a light covering of snow around us and a good dusting of snow on the Paine Massif above us. We hiked beneath the Paine Massif that morning towards the French Valley. Winds hitting scenic Lake Nordenskjold sent water plumes hurtling up 80 feet in the air. While the sky was clear, it was another hint of the weather to come. Hiking up into beautiful French Valley we needed to turn back down as horizontal rain and sleet forced the park service to close the northern overlook. Our “trail” was now a foot deep torrent. And we ended the day, cold, wet and tired at Refugio Cuernos. The refugios are a Patagonia tradition. They are buildings where you can buy meals, warm yourself by potbelly stoves and if necessary rent a shared bunk room (ala a hostel) with the bathroom down the hall. Some refugios also rent cabins. We warmed up, ate dinner that night in the refugio, listened to wild tales of Patagonia from our guide Alejandro and headed back out to our tent. The next day started out cold and snowy, but the view of the mountain above the refugio was incredible. Snow dusted peaks peaked out of snow clouds. Within a couple of hours the sun had come back out, and the day brightened as we sat by the lake looking in awe at Mount Almirante Nieto. Because of the wind and proximity to the coast, the air in Patagonia is the freshest I have ever breathed. Fresher than Nepal. Photographs are some of the crispest I have ever seen. There is no haze, no air pollution. And the trails are pristine. Alejandro would stop to pick up the smallest gum wrapper. Clearly litter is something the Chilean culture doesn’t tolerate. Towards the end of the day the peak of Cerro Paine beckoned, and we headed to Camp Torres, our campground for the last night. The refugio here is by far the nicest. And some choose to camp here because of that even though it means a longer hike the next day up to the Towers. There is a closer refugio in the mountains below the Towers. The next morning we woke up to another wonderful sunrise and hiked beneath Patagonia’s famous lenticular clouds past Cerro Paine. The hike from the base in Camp Torres can take anywhere from three to four hours depending upon weather. As we hiked up that morning we noticed some horses dwarfed by the mountains above. As we got within an hour of the towers we were climbing in close to half a foot of freshly fallen snow. It was slippery but stunning. Alejandro led us to a ledge slightly above the lake at the Towers for some unique photographs. I found the Towers stunning, but the view back across the valley (which showed a storm approaching) was equally awe-inspiring. After some celebratory shots and back slaps we trudged back down from the towers to Camp Torres. It had been a wonderful trip. And as we drove out of the Park we took photograph after photograph of the Towers that loomed in the distance. It is sometimes best to look back upon trips after doing a few more and seeing how they each linger. 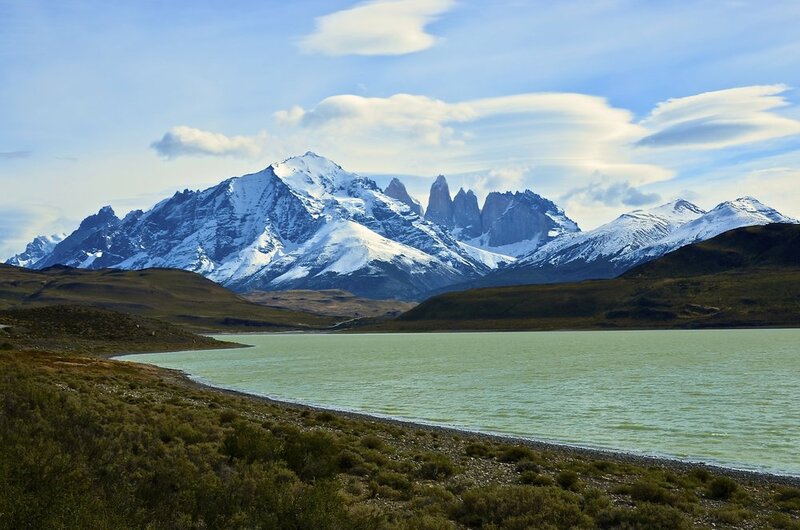 Patagonia is simply stunning. Clean, fresh, raw, rugged and a hundred other adjectives that can’t capture a marvelous wind swept landscape of seemingly endless mountains. I hope I return to passionate Patagonia many times in my lifetime.